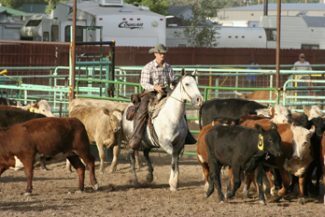 Nate Adams competes in the team penning at the 2011 Delta County Fair. If Adam were riding another horse other than his own, if something happened, the horse owner could be liable. It only takes a second. The horse spooks, and someone falls off a horse at a training facility. Many trainers think that they may be covered by the equine liability law, but in fact, they may be looking at a potential lawsuit if the proper steps are not taken. Julie Fershtman, Attorney at Foster Swift Collins and Smith, P.C. in Michigan, is one of the top equine law attorney’s in the country. She recently spoke to horse owners at the Equine Business Conference on the issue of legal liability and contracts, a very important topic for horse owners. “Nation wide, 46 states have equine liability laws. Every single one of the laws differs in many different ways,” Fershtman said. In Colorado, the equine liability warning signs must be posted by every equine professional. The goal of the sign is to warn people about the risks involved with an equine activity, and to help the equine professional avoid lawsuits. When referring to “Engages in an equine activity,” it means riding, training, assisting in medical treatment of, driving, or being a passenger upon an equine, whether mounted or unmounted or any person assisting a participant or show management. The term “engages in an equine activity” does not include being a spectator at an equine activity, except in cases where the spectator places himself in an unauthorized area and in immediate proximity to the equine activity, according to Colorado law. The law states that the inherent risks are: (I) The propensity of the animal to behave in ways that may result in injury, harm, or death to persons on or around them; (II) The unpredictability of the animal’s reaction to such things as sounds, sudden movement, and unfamiliar objects, persons, or other animals; (III) Certain hazards such as surface and subsurface conditions; (IV) Collisions with other animals or objects; (V) The potential of a participant to act in a negligent manner that may contribute to injury to the participant or others, such as failing to maintain control over the animal or not acting within his or her ability. However, exceptions do exist. “In just about every state with an equine liability law, there are exceptions. This is where your lawsuits will come from,” said Fershtman. The best way to avoid this lawsuit is to always provide equipment that is in good shape and is taken care of, according to Fershtman. To avoid this, anyone providing a horse for someone else to ride must assess the rider’s skills through questioning and a riding test. “Know your animals, and ask a lot of questions to people that are about to ride or handle your horse,” she said. “What is a latent condition? That’s a condition in the land you just can’t see. If someone is injured from that, and you fail to put up a noticeable warning sign telling people about that dangerous latent condition, you could be liable,” Fershtman said. If such a condition exists on a property, the area should be clearly marked, or fenced off so that people are not injured. The fourth and final exception in Colorado law is pretty simple. It states, “Intentionally injures the participant.” If an equine professional intentionally injures someone, they are liable. One of the biggest issues the equine liability law is in the exception of negligence. However, in Colorado, this is not a listed exception. “A claim under negligence boils down to this. A claim against you under negligence is a claim that says you didn’t act reasonably, or act as a reasonable person should. Negligence is a standard loaded with trouble because it is often up for discussion and dispute as to what a reasonable person does and doesn’t do. Negligence is a very difficult standard to deal with,” said Fershtman. Liability is also very important when it comes to a release of liability, or waiver. “Of all of the business contacts that you use regularly, the most important is, in my opinion, the liability release, also referred to as waivers. This document merits serious attention,” said Fershtman. She gives a few suggestions when drafting a liability release. Those are: readability, title stating Release of Liability, the parties being released, who is signing, risks and equine liability act language. When speaking about contracts, she reminded people to be clear in what they have in their contracts. “Make it clear what people are signing. You don’t want them to think they are being tricked,” she said. Liability is a very serious issue for equine professionals in most states, including Colorado. Knowing and understanding the law and the exceptions are the key to avoiding lawsuits.